Happy August everyone! Feels good to be back to discussing some books! 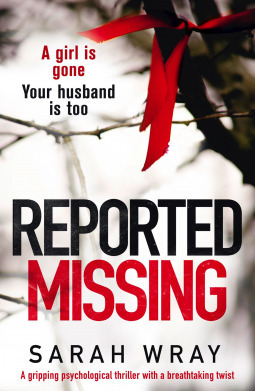 This month Blodeuedd and I read and discussed "Reported Missing". Blodeuedd is in red and I am in blue. So we wanted to try a new genre or something. We had originally meant to read Gather the Daughters, and omg we could have discussed so much! Sorry Carole! But that did not work out and here we are thanks to netgalley. Uggh! So sad I wasn’t able to get it :( Oh well..can’t win them all. However, I am kinda happy we were able to read this one. Netgalley is a good source for books, and we did pick one we could discuss! Win! So what did you think? I liked it overall. I was a little unsure as I was getting started but once more details and whatnot of the case(s) of the missing husband and girl was revealed I was hooked. You? Yes and that is what made it good. So many questions...so many possibilities. I also really liked how unreliable Rebecca seemed even though I felt she was the most honest. Everyone else seemed to be holding something back. Especially Jeanie...I suspected her on SOMETHING. IDK what, but she was guilty of something. And btw...screw all the people in that town. JERKS! I did always trust her. That she knew nothing, BUT, something doubts crept in, she was just sad sad and kept on drinking. She was so distraught. But most what ifs obviously came about the husband. I wanted to believe he had just left or something. Not that he was a phedophile. Also YES omg those fuc*ing townpeople! It was not her fault. Omg it was not like she put him to like little kiddies, like if she was better looking or put out more he would have stayed. ALSO, we do not know if he did anything! Innocent until proven guilty asshats! I did hate how they looked at her like she was tainted. As for Jeannie, no, did not wonder there. I...lost my point...wait a minute….SimoN! Yes I did give him the shifty eye a few times. Yes, I really didn’t understand all the hatred. If anything they should’ve felt bad for her and pitied her. Jerks the lot of them. And yes, I had my doubts here and there about Reb. I think the author did that on purpose. Even though you KNOW she is innocent and miserable...there are some times when you have to give her the shifty eyes. I liked that. And yes Simon...he was a little suspect here and there. I know that some do not like unreliable characters since there has been so many of them, But I did how the author made it here. It is not really that she is unreliable. It is more that we know nothing. Nothing at all. And the cops are sure not talking. So the entire book is her trying to know more. About the missing girl, about her husband. And I liked that since it made me question everything and everyone. Yes. It was well done. Now, I did NOT like the ending and how everything came to light. I feel like it was too easy in a way. I’m not sure...but I didn’t like it. Did you? I felt it was too sudden. I was seriously wondering if she was in a coma or something. It just felt like I missed something and then aha...ok good I guess? Yeah...it kind of just ended. I didn’t really expect the final answers. I had my guesses but I didn’t expect it. I wish we could say more without giving away any spoilers. LOL!!! It did become clearer as we read on so yes I guessed it too, half of it at least..wink, since we can not say more. Alas spoilers. But all in all, made me mad, had me guessing. I guess it was a good book then. Hahaha dang spoilers! But I agree. It was pretty good. Not amazing and the ending disappointed me. I loved the mystery and how everything was slowly revealed to us as the story went along. I do recommend it for those that like a good mystery. The ending came too fast. It was more ok now I need an ending so I am gonna fast forward a bit. So that could have been done better. It was a confusing jump. But all in all good, and for those who like to keep on guessing then this is a good book for you. And we tried something new, yay. Yayy!! I am glad we read this. It was good to read a mystery. I really do love them. Short and sweet. It’s hard to really get in depth about a mystery due to avoiding spoilers ;D Give baby some love. The end? Melliane, it was a random find. A random find but a good mystery - sounds nice! Sometimes those random ones are a charm!